There are many choices of laminating pouches on the market They come in small sizes like Data Card pouches to as big as Menu Size laminating pouches. The best way to figure out the size you need is to measure out the items you want laminated and compare it to the different sizes available. Chances are, you will find the size based on the description of the product. 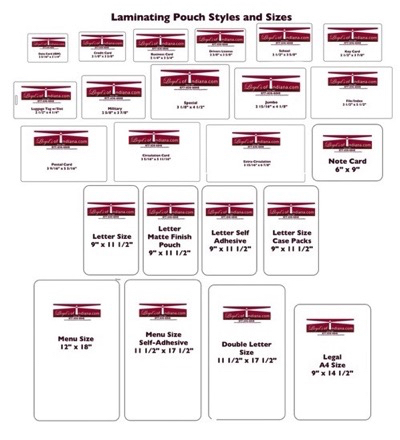 It can be difficult to figure out, as there are 25 plus different types of laminating pouches available. You also need to consider the thickness of the pouch. Most laminating pouches come in either 3mil thickness up to 10 mil. 3 mil provides a light coating, while 10 mil will have a very thick coating. To help you narrow down your search, let’s take a look at the 5 most popular laminating pouches most people purchase. Letter size is by far the most popular out there today. Letter size laminating pouches have a variety of uses. As an example, a customer of ours uses letter size to laminate his seasonal coaching plans for his soccer teams. By laminating the pages, it protects them from the elements when he is out on the field with his players. Business customers use laminating pouches to laminate interoffice call lists or safety signs. Schools get a lot of use out of letter size laminating pouches by posting important instructions on the walls to their students. Letter Size is by far one of the most versatile products available. Luggage tag pouches are very popular right now. They are being used at many trade shows around the world. One way to use them is to laminate booth visitors business cards to marketing material they can use. Airlines will use them to promote destinations. Travel agents may use them to laminate their client’s luggage tags for their upcoming trip. Luggage tag pouches continue to be one of the more popular pouches available. ID Badge pouches continue to be popular. It is easy to produce an id badge using a pouch lamination machine. Without the need to buy an expensive ID Badge System, you can print a picture and put it through a pouch laminator. It’s easy. Menu laminating pouches are a nice size. 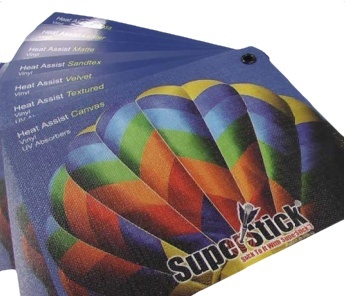 You can print a large card or paper which can then be laminated using a menu laminating pouch. Menu laminating pouches are great for restaurants that want to vary their menus seasonally. They can print their menus and run them through a laminating pouch. Or, of course, their printer can do it for them. Menu laminating pouches are almost indestructible, so they are perfect for a restaurant that hands them out to hundreds of people each day. If you find that you need a specific size, you can always request a custom cut pouch. As an example we have had customers request a pouch be cut into a T. Or, we have had customers request they be cut into a bookmark shape. They could be using them for game cards. They could be using them as part of a craft project. They do cost a little more, but they will give you what you need. If you are a school, a law office, an accounting firm or any organization that needs to protect documents, chances are you will need a laminator in the office for general needs. Next Post:Print 2017 Chicago Highlights – New REVO Eco-coat UV Coating Fluid launched!